I was married over the course of three weekends in July 2002. 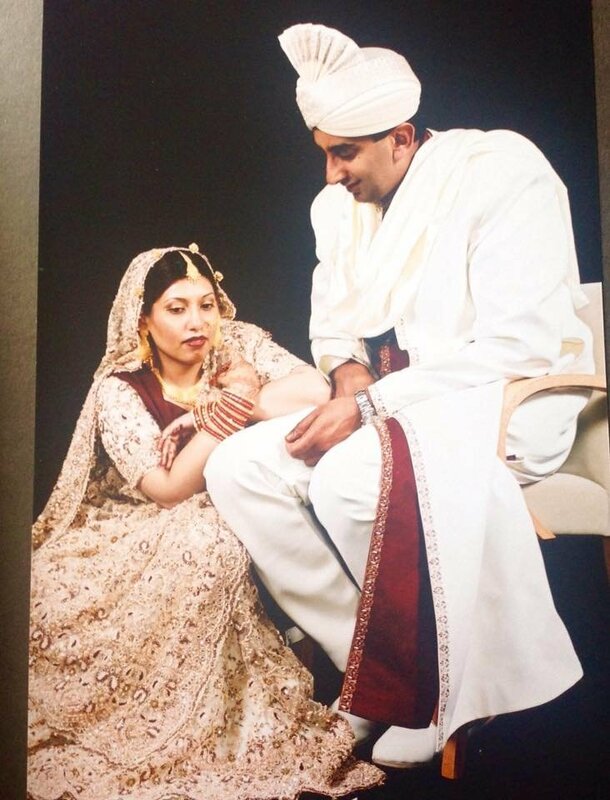 My Nikkah ceremony, which is the religious act of marriage for Muslims, was on the first Saturday, 14th July 2002. I remember the day well, not least because I scalded myself on the steam from the kettle that morning. It was an emotional rollercoaster of a day, but on a deeper level for me it was a day where I found anchor after feeling adrift for some time. The last fourteen years have taught me a lot about commitment, compromise and being part of a team. I have learned to be more resilient and trusting. I have dealt with health issue after health issue and been left astounded by the short straw I drew, but I have also been surprised by my own capacity to adapt with adversity and see everything through a sense of humour. None of the positives of the last fourteen years would have been possible without my husband and I cannot imagine living through the negatives and coming through intact without him. Indeed when I look back over my life, the one constant and solid relationship I have is that with my husband. Our relationship is based on honesty and sheer grit to get on with whatever life throws at us, and we have had more than our fair share of tears, frustration and disappointment, but I wouldn’t change anything: not the illness, investigations, diagnosis and draining treatments I endured, which barely take me up to our tenth wedding anniversary when I was diagnosed with Pulmonary Hypertension. Through thick and thin, better or for worse, I have been enriched by my marriage to a man who doesn’t know the meaning of giving up and is single-minded in his drive to do the best he can, even when no one is looking. He has come to define the words consistency and integrity in a world that keeps changing. I just hope I live up to my end of the bargain, which has always simply been to be well enough to laugh. I hope my wife feels much as you do, as she wrestles with health issues. For me it’s simple: what part of “in sickness and in health” is confusing? I swore to love, honor, and cherish her under those circumstances. This is uncomplicated. It means that I must help her with goodwill and true marital love. Your husband sounds like my kind of man. I’m sure she does and you are so right when you say it really is so uncomplicated to be open, honest and upfront. Maybe I lack the sophistication of complexity but I would never change what I have with my husband. Congratulations on what you have built together. A wonderful achievement to have something so solid in these disposable times! Thank you, I think we are very fortunate and I give thanks everyday for what I’m blessed with. Thank you, the picture was half a dozen illnesses ago. I think you know when you’re with a good one. Beautiful! My husband and I got married 8 months ago today (November 14, 2015). I’m inspired by stories like yours. “In sickness and in health” is also a no-brainer. Fortunately, my husband and I haven’t experienced any serious illnesses as of yet, aside from my diagnosis of Generalized Anxiety Disorder (GAD) a few months before our wedding. The photo you included is gorgeous. Thank you for sharing! Thank you, you’re very kind. I think in hindsight when we met and married I was in firm denial of being unwell. It was a torrid four years later I got diagnosed with endometriosis and diabetes, then in 2009 I was diagnosed with OCD and GAD. In all honesty I am more tuned to feeling happy now than I did when I was allegedly “well”. The first year of marriage was a good time I remember fondly, I hope you are making many happy memories and wish you the best in this exciting time in your relationship. I was just saying to my husband, despite the illnesses, if I could do it all again I definitely would. Thank you, when it feels right, it feels right. I’m reading Cargo at the moment and omg! Aww, this is such a sweet post. It’s inspiring to hear stories of marriages that work. Your photo is also gorgeous. Thank you, we are lucky.